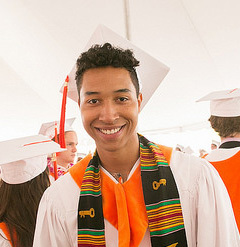 Claremont, Calif. (June 22, 2016)—Pitzer College congratulates Brendan Nwankwo ’16, who has been awarded a position with Teach For America. A combined anthropology/English and world literature major, Nwankwo will teach in a low-income community in Chicago, IL, for two years. Nwankwo is passionate about increasing educational equity and inspiring young people of color to pursue education. “I am drawn to educational spaces, both teaching and learning from students, and to helping cultivate successful future adults,” he said. At Pitzer, Nwankwo was a tutor and mentor for Tutors for a Cause, a student-run program that connects Pitzer undergraduates with the children of dining hall staff members to help with homework and share life lessons. Teach For America (TFA) is a national teacher corps of outstanding recent college graduates, graduate students and professionals who commit to teach for two years in urban and rural public schools. Teach For America corps members hail from more than 800 colleges and universities, and 1 in 3 TFA teachers are the first in their families to graduate from college. Since it was founded in 1990, TFA has grown to more than 50,000 corps members who have reached more than 10 million students.